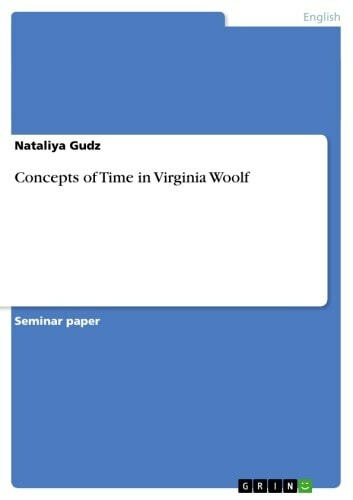 Seminar paper from the year 2005 in the subject English Language and Literature Studies - Literature, grade: 1.0, Otto-von-Guericke-University Magdeburg (Institut für fremdsprachliche Philologien), 13 entries in the bibliography, language: English, abstract: Virginia Woolf took her life in March 1941. Her fear that she would no longer be able to live meaningfully, according to her ideals and particular vision of life, forced her to choose death as salvation. To her, death was not an ending. The spirit above all had to be preserved. Like her character Septimus Warren Smith, under the strain of mental illness, she threw her life away in order to preserve that which was most sacred to her - life and integrity of the soul. Probably it seems to be a contradiction - to destroy one's life in an effort to save it. 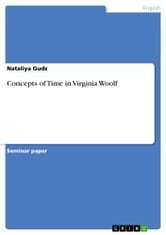 There are many such paradoxes in Virginia Woolf's thinking, due to her emotional nature and to her special way of looking at life, time, and space that shapes reality itself. In this vision of life as an eternal process, the concepts of time and space, invented by man, have no meaning, because reality exists outside of them. By passing his temporal life man views all things in relation to himself and his life on the earth. But it is rather difficult to squeeze one's life among birth and death, for man permanently organises his experience into rather relative formulations of interweaving time and space. And reality, as viewed by Virginia Woolf, includes the whole expanse of space and time, and every living form brings its historic and prehistoric past into the ever-flowing stream of life. The present moment is never isolated, because it is filled with very preceding moment, and is constantly in the process of change. Time flows with the stream, having neither beginning nor end. Reality is actually timeless and spaceless, because it contains all space and all time. Believing in the eternal process, Virginia Woolf also demanded a revolution in literary technique and subject matter. She reconsidered personality, language, plot and structure in a new light. Personality was continuously in the process of taking shape and could not be accomplished by external descriptions. Language had to convey the emotions and perceptions of different levels of awareness all at the same moment, revealing the unconscious as well as the conscious things. Plot had to be eliminated, since action held no interest. The only thing that mattered was the inner life. Filled with the 'moments of being', it revealed to a person the pattern behind the woolly curtain of existence and through it, connected him to the other people and the outer world. Metafiction in American Short Stories - Readers' Perception of Language and Symbols in Shattered Realities.